Ageing and gaining extra weight often leads to development of dimpled skin. This is most often noticed on the buttocks, hips and thighs, especially in women. The peculiar way in which the connective tissues are joined with the underlying fat cells and muscles in women tends to make them more prone and hence ‘cellulite’ is seen affecting women more noticeably. Cellulite (also known as EFP or Edematous Fibrosclerotic Panniculopathy) forms when the fat deposits underneath your skin disturb the natural formation of the connective tissues, causing lumps to form all over the skin covering it. Although mild dimpling of skin is normal, due to some factors that tend to result in development of cellulite. Your age, genetics, skin thickness and distribution of body fat are the main factors that decide the formation of cellulite. Cellulite is seen when the underlying connective tissues shrink or shorten, thus pulling the skin in certain areas while leaving the other areas flat. What are the Cellulite Treatments? Thanks to advances in cosmetic science, today there are several solutions to treating cellulite. Although simple dietary changes, combined with some topical creams, may alleviate mild forms of cellulite, severe cellulite formation demands cosmetic cellulite treatments. In this non-invasive cosmetic treatment, sound waves are used to treat the affected areas. The sound waves of a particular frequency help to break down the shorted connective tissues, thus allowing the dimpled skin to resume natural level once again. Therefore, multiple sessions of AWT are required for the best results, along with certain after-care instructions. In this cosmetic non-surgical cellulite treatment, an advanced laser device is used. The laser is able to penetrate the upper layers of your skin without any damage to the healthy tissue. Laser light treatment is often combined with radiofrequency treatments to ensure the best results. In radiofrequency technique, a device is used which emits particular waves of radiofrequency on to the targeted connective tissues underneath the skin. As this is a non-surgical cosmetic process it does not require making incisions of any kind. Although conventional liposuction is not much effective in removing cellulite combining it with another technique has shown promising results. In the innovative laser-assisted liposuction technique, a powerful, thin beam of laser light is used for removing excess fat tissues from the dimpled areas. This combination of laser light to melt the excess fat and removing it using liposuction method helps to effectively remove cellulite as well. Apart from laser-assisted liposuction, ultrasonic lipo-sculpting has been found to give successful results when it comes to cellulite treatment. The use of focused sound waves to melt the underlying excess fat from the skin and removing it using liposuction helps to effectively level the skin on the cellulite-ridden areas. 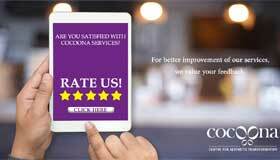 Cocoona Center for Aesthetic Transformation is the most popular because cosmetic solution destination in India. The immensely expert team of skin specialists and cosmetic surgeons provides world-quality cosmetic treatments, including affordable and effective cellulite treatments, to all patients.